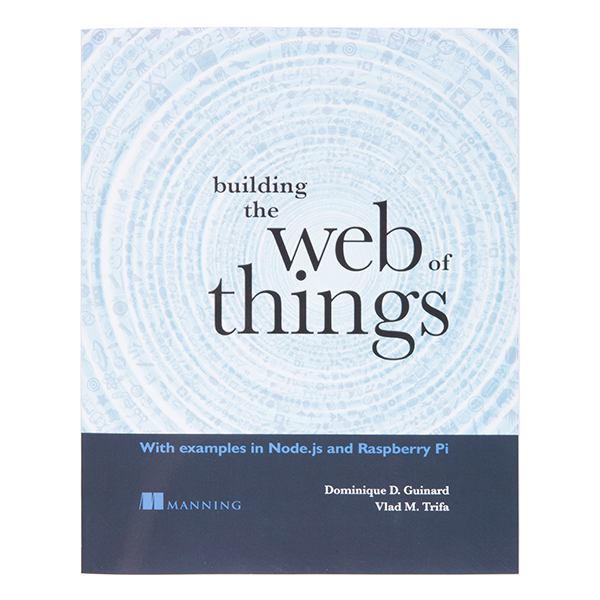 This is the Web of Things (WoT) Kit, a comprehensive and hands-on kit that teaches about the intersection of the Internet of Things (IoT) and modern Web technologies. This kit utilizes the Raspberry Pi 3 model as its medium to teach with an 16GB SD card and USB cable, a prototyping board with jumper wires, and all the various sensors (motion, humidity, temperature) and LEDs. In a few hours, you'll learn how to use Node.js to build a flexible REST API that allows anyone in the world to interact with your Pi in real time! You'll be out of the box and at "Hello, world" in no time! After a broad introduction to the nuts and bolts of the Internet of Things (devices, sensors, standards, tools and more), Building the Web of Things quickly moves up the (protocol) stack and focuses on the Web of Things - the Application Layer protocol for the IoT. By providing the right balance between theory and practice, you will be rapidly able to navigate the complexity of the Web of Things and learn about a wide range of tools and techniques to connect IoT devices to the Web and built interactive applications on top. Once you've configured your Raspberry Pi, you will learn how to wire various sensors to it and access them from Node.js applications. Afterwards, you will learn in detail the elements of the Web of Things architecture that you can leverage to REST APIs for physical objects, discover and describe devices using the latest developments in the semantic Web, sharing and securing data, and combining these components to rapidly build distributed applications and physical mash-ups. Each chapter will help you gain the knowledge and skills you'll need to fully take advantage of a new generation of real-time, web-connected devices and services and to be able to build scalable, enterprise-ready applications that merge the physical and digital worlds. Hi all, looking at the reviews the place where to get the source code is not clear enough, you can get it from github on: https://github.com/webofthings/wot-book and we are updating the page to make this clearer. Which book is included? When will these ship? 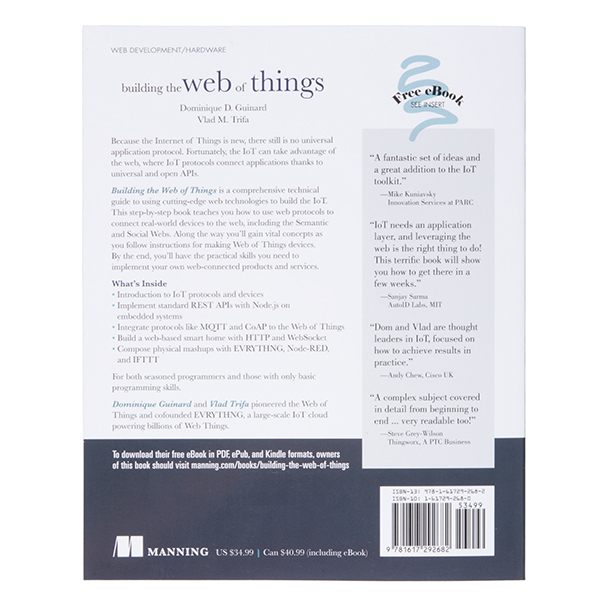 It is actually the "Web of Things" book (see pictures and links in the description). These are also currently shipping. does this come with the MEAP combo (pbook + ebook)? or which version of the book does it come with? Yes, all the physical Manning books come with the free ebook as well. 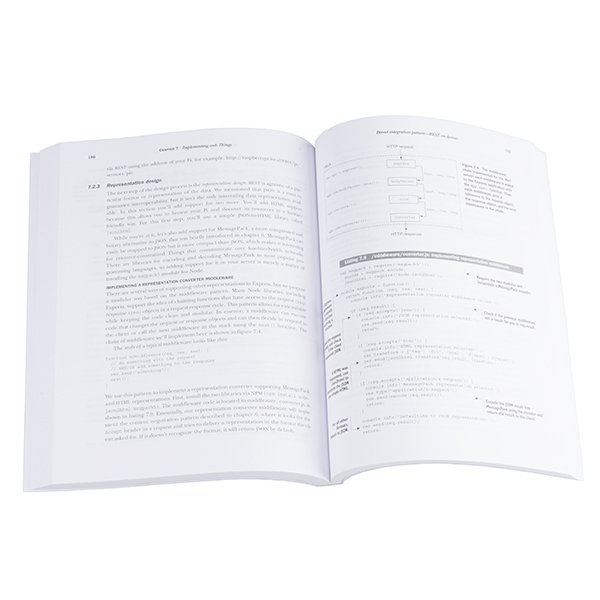 Note that it isn't a MEAP anymore since the first version of the book has been published. Any word on when this will ship? I thought when I ordered it was held up only because of the Raspberry Pi 3, but it looks now like it's waiting on the book to ship? Any word on when that will arrive in stock? You probably saw that but they are now shipping since about 2 month. To access the code, you have to use either svn or github to download the entire operating environment. To register the book, you need to create an account with Manning. Why can't SparkFun just sell shtuff that you can use and not have people and corporations attach their hooks into your computer. Time:The next day. I sent an email to the authors about my issues and got a quick response which was very helpful. One of the authors indicated that he had updated their web pages and the book to clear up the issues that I had. So I'm rolling now and much less disappointed. 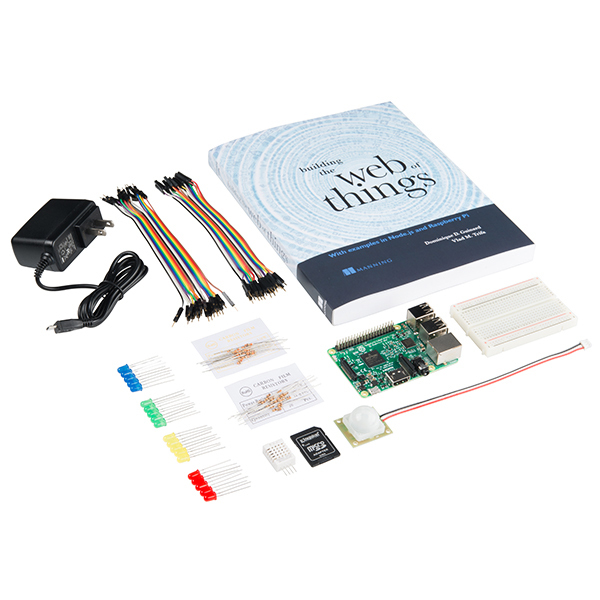 Very nice kit and systematic approach to building the Internet of Things using Web technologies. Chapter 4 of the book gives you a nice step by step guide to setting up the Pi with Node.js and hooking up the hardware components. I'm very disappointed with the book, It's much too hard to follow, not because of the subject matter but, it's just not written well. One person's opinion. The book is excellent and the kit appears to have all the necessary parts to put together some examples of IoT and WoT technology. I was hoping for something from Sparkfun that walked the student through the setup of the components in the kit. It can be figured out from reading the book but I was just expecting a more inclusive package not just the book, a Raspberry and the passive components.